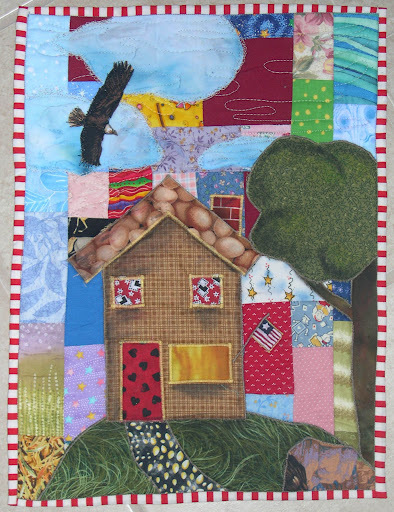 Jamie Fingal posted on the Quiltart mail list that she was inviting participants for the house quilt project. 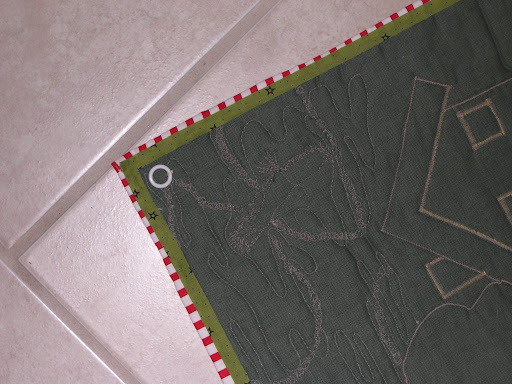 There are instructions on the blog for the two house projects. Since Ron is retired Army and one of my sons is a West Point graduate I wanted to participate with a house quilt for a service member. The house has to have a flag and be a specific size but then it is up to the artist to do as they please. You can see the flag flying and there is an eagle flying overhead. If you look closely you will see some falling stars that I thought were fitting to represent the fallen heroes. I was not pleased with the wonky binding on the back but I didn’t want to do it all over again. So I hit upon the idea of fusing thin strips over the stitching for a nice neat back. This won’t be judged and I think it might find its way into my box of techniques . this turned out SO nice, didn't it!!! Love your idea for fusing on the back…clever! Looks great to me! What a delightful little quilt! I'm sure the recipient will be so pleased and I love your solution for the back.